Minneapolis lost one of its only parks named for someone with a German surname in 1939. Given that more Minneapolitans define their ancestry as German than any other nationality — nearly one in four — it seems a bit odd that a city with more than 180 parks would have so few named after people of German descent. As I was looking over a list I compiled of Minneapolis park properties that no longer exist, I was struck by the description of Rauen Triangle; a 1930s park inventory claimed that the triangle was named after “German settler” Peter Rauen. When that triangle was paved over in 1939, the only park property that remained with a German name was Humboldt Triangle in north Minneapolis. Alexander von Humboldt was a German naturalist and explorer who died in 1859. Even Humboldt’s name adorned a park property by default rather than by choice; the triangle took its name from its location on Humboldt Avenue. Rauen Triangle was a small piece of land (0.03 acre) at the oddly configured intersection of 11th Avenue North, North Fifth Street and North Sixth Street. The park board purchased the land at the request of residents of the neighborhood in 1890 for $3,462 — a price that seems exorbitant for such a small, otherwise useless tract. The entire cost was assessed on property in the neighborhood. It was given the unimaginative name of Fifth Street Triangle. If the Nomenclature Committee had had its way in May 1893 the triangle would have been renamed Iota Triangle. The committee of Harry Wild Jones, William Folwell and Patrick Ryan had suggested naming most of the small street triangles after letters of the Greek alphabet. The park board approved many other names recommended by the committee that day — Kings Highway, The Beard Plaisance, Logan Park, Windom Park, and Van Cleve Park — but returned the Greek alphabet names to the committee for further consideration. Good choice. After further deliberation, instead of Iota Triangle the committee returned with a recommendation of Rauen Triangle in honor of Peter Rauen, a German who had arrived at St. Anthony in 1856. 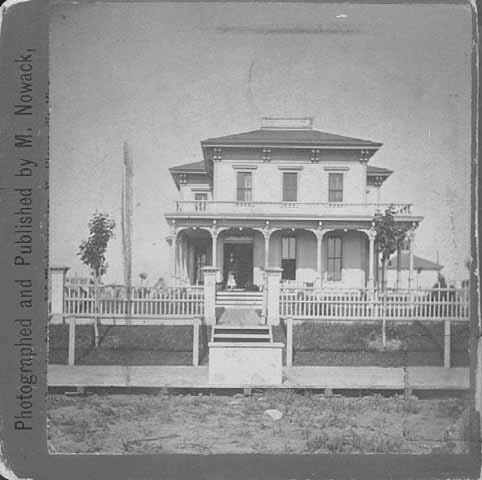 The name made sense because Peter Rauen’s home at 1101 North Sixth Street faced the triangle. Rauen operated a successful grocery and general merchandise store at the corner of Plymouth and Washington. He was an alderman on the first city council after the merger of St Anthony and Minneapolis in 1872 and he was mentioned in Horace Hudson’s early history of Minneapolis as a prominent president of the Harmonia Society, one of the more successful musical organizations in the early days of Minneapolis. The park board gave up Rauen Triangle in 1939 to the city of Minneapolis. 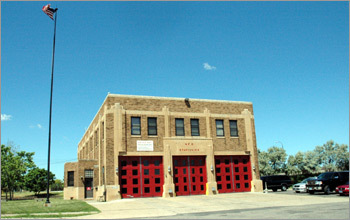 On the same lot that Rauen’s home had once stood, the city built Fire Station 4, which still stands on the site. It seems that the triangle got in the way of the long hook and ladder fire engines maneuvering into the station. The triangle was paved over to create a quite wide intersection. In Rauen’s time the neighborhood was all residential, but it is now completely industrial and hemmed in by freeways. Since the demise of Rauen Triangle, two other Minneapolis parks have been named for people with German surnames: Mueller Park (1973) and Gluek Park (1995). I don’t mention the nationality or ethnicity of park names as something that needs to be addressed; it is simply an observation. The only name missing from a Minneapolis park that really must be added is Horace Cleveland’s. I lived on 5th Street, just east of that triangle, from 1971 to 1984. I always wondered why it was there, thanks for answering my question! You’re welcome. That’s why I do this. I post answers to questions I hope someone might ask! Hi, I am Peter Rauen” s great great grandaughterl. I have never seen this house photo before. Thanks for your work in preserving Mpls., history. I have been told by family that Peter bought the entire block and it was callled the Rauen block. The other lots were to be given to his 5 children to build their homes when they married. Thanks for reading, Mardie, and for adding information. Any idea what became of those plans for family togetherness?